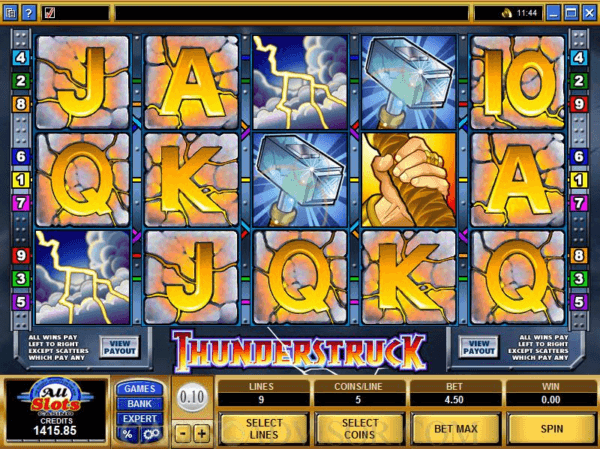 Thunderstruck is a pokies game from Microgaming with Old Norse mythology, where there are many gods with special powers and responsibilities. Thor is one of them and he is the god of thunder, This video pokies game has 5 reels and 9 paylines together with the simple graphics and the rewarding gameplay. There are two bonus games and the jackpot win consists of 10 000 coins. So, on the reels of this game are symbols of Thor, rams, Thor’s hammers, Thor’s hands, castles, lightning, horns and A to 9 card icons. The image of Thor is the Wild symbol with advanced functions. This means that in this game, when the Wild icon replaces other symbols in winning combinations, it will also double the payout from these combinations. The Thor image is also the jackpot symbol and five of them will award you with the highest prizes. If you choose free pokies with bonus feature, usually this bonus game is the free spins round. At least three Scatter symbols (Rams icons) will start 15 free spins, where all wins will be multiplied by 3. The appearance of more Scatters will activate another round of free spins here. There is a Gamble feature where luck can help you to double or quadruple your prizes. You can play this game on your mobile or PC free or with real money at online casinos.